I have always been the type of person who strongly believes in the motto ‘hair is there for a reason’ when it comes to your privates. I still stand by this to my very core and I’m not sure that my mindset about this will ever change. I actually get grossed out just thinking about being completely bare down there but of course this is my choice and my preference and to each their own. Up until last week, this 22 year old hairy female had never gotten a wax down there, let alone fully shaved because I don’t have time for that and I haven't had a long enough reason to maintain the hairless vibe as I have been single my entire life. So it was a casual Saturday and I wanted to see what it was like to get waxed; I wanted to see what the fuss was all about. Getting waxed was something that had been going through my mind for quite some time now and the timing was right so I thought 'what the hell! ', might as well try something new this week. So I went on my handy dandy laptop, looked up salons that had waxing services on Saturdays, although by this time, it was already past 4pm so my options were limited as most salons close around 5. BUT I WAS IN LUCK because I found a spa that had an opening at 5:45, right before they closed at 6, and it was a less than ten minute bike ride away! 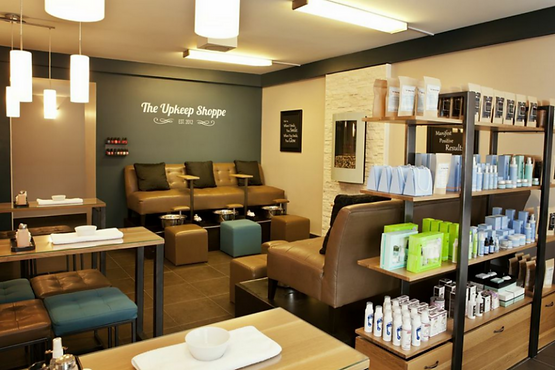 I ended up going to a cute little spa called The Upkeep Shoppe at 358 Preston Street in the heart of Little Italy. As soon as I walked in, I was greeted by a lady at a front desk and the place was filled with many getting their nails done on the first floor. The space had a very clean and refreshing vibe to the atmosphere and everyone there seemed to be enjoying themselves. I was directed up to the second floor where I sat and waited for about a minute before heading into the room designated for waxing. The room we were in was very clean and tidy, it had some cute designs on the wall that corresponded with the rest of the vibe of the place. I wore a dress because from the research I had done, I knew it would be less awkward to just take off your underwear compared to pants and underwear. I ended up getting a bikini wax and the person who did my wax was named Brittany. She was very nice and made decent conversation with me, she was very considerate when doing the wax since I did tell her this was my first time getting it done. EVER. The pain was no where near as bad as i thought it was going to be but I am the type of person who finds an uncomfortable enjoyment about getting tattoos done; it hurts but I like it. I thought the pain of waxing was going to be so bad I was going to cry. I mean it is a sensitive area down there and since I have never even gotten my eyebrows waxed, the only thing I was expecting, was for it to hurt but it wasn’t that bad. It was uncomfortable and not pleasant but it was not as horrific as I had imagined. The warmth of wax was kind of weird sensation that I did not hate either. Overall, it was better than I thought it was going to be. The whole thing took about 20 minutes, from when I stepped foot in the door to when I left. I would consider it cost about 32 dollars including tax and tip. I thoroughly enjoyed my experience there and would recommend it as a reasonably priced place for a waxing with a calm clean and positive environment in Ottawa. Also, I would definitely consider going back there for another wax, a possible massage or even getting my nails done in the future. Book your appointment with them now!